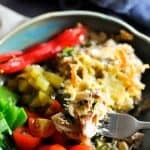 This healthy Tuna Pasta Bake is a versatile meal, not to mention its healthy, yummy, and high in protein, even with the pasta, thanks to the high protein penne pasta I chose for the recipe. I mean, seriously I would eat this for lunch, for dinner, and after a gym workout. It nutritious, good for you and easy to make. Anything that is baked in the oven with cheese on top and has crunchy bits, and is under 400 calories per serve is a winner in my book! 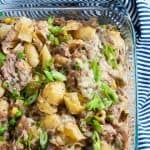 This is also one of those recipes that is great to make on a Sunday evening, you know, while you’re making your other actual Sunday dinner because this tuna bake keeps in the fridge for a few days and it also freezes well. Perfect for pulling out after a long day at work…. Or just when you don’t feel like getting saucepans out. Eat it cold or warm. It really is good either way. Portion it out. Store leftovers in lunch or dinner sized portions that you can eat in one sitting. I find this makes it easier to grab and go when you;re in a hurry. When you make this dish and eat it straight from the oven, that delicious texture from the breadcrumbs combined with the stringy cheese is oh so good! I actually felt good eating it to. You know those dishes where you enjoy preparing them and then there’s the anticipation of eating and then the actual eating, and sometimes it just doesn’t come together. Well, this does come together. I felt good preparing it, and I felt good eating it. And afterward, I wasn’t hungry. Just happy that I had cooked a good solid healthy nutritionally balanced tuna bake that I really enjoyed! Love tuna? 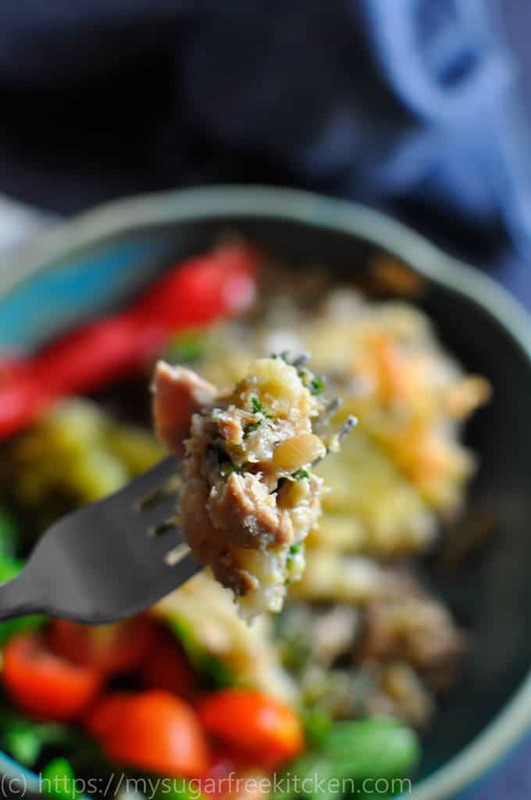 Then check out my Tuna Mornay Pasta Bake for a slightly more richer tuna dish. There’s nothing like getting all your nutritional requirements in one meal! 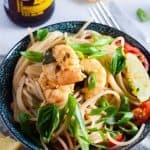 Fibre from the kale and broccoli, protein from the tuna and carbs (and protein) from the pasta, especially when you choose high protein pasta. 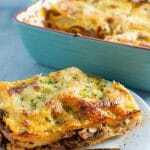 It’s hard to go past a tuna pasta bake for all round versatility, and I love it because it’s easy to make and stores well in the fridge and freezer. An all round winner for me. If you love your seafood like me, check out my healthy no fat salt and pepper squid or my on the table in 30 minutes one pot moroccan fish stew. 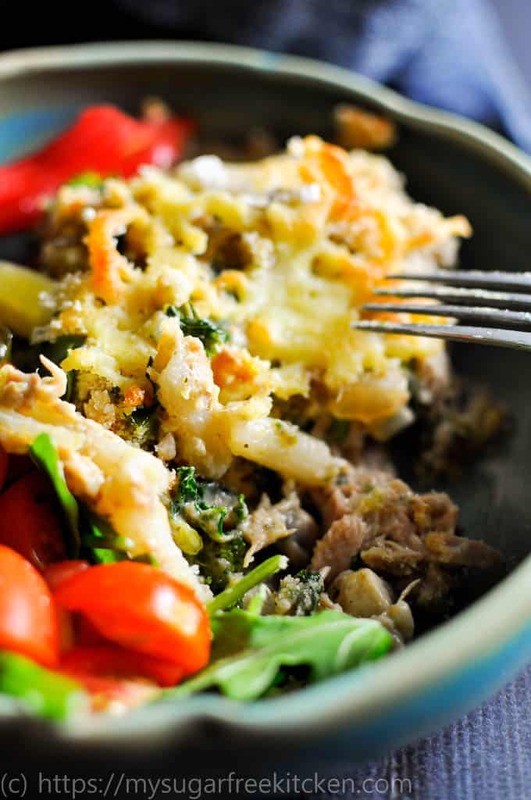 This is a healthy and delicious Tuna Pasta Bake with green goodness from kale and broccoli. High in protein, low in fats, this is definitely a meal that will keep you fuller for longer. Whilst stiring the white sauce, whisk in the powdered soup until it is all combined. This acts as a thickener and will change the consistency of the sauce to be thicker. Take of the heat once all combined. 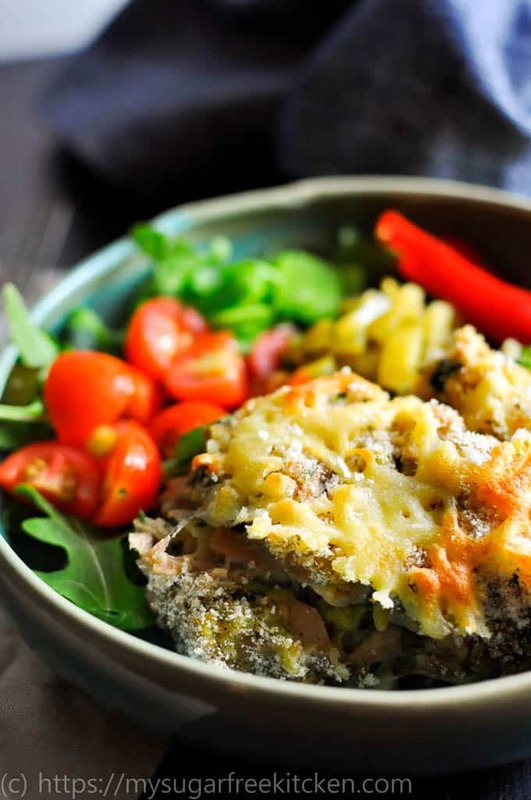 In a baking dish, spoon the tuna pasta mixture until evenly spread. Spread the multigrain breadcrumbs and cheese. Bake in oven at 180 degrees C for 20 to 25 minutes. 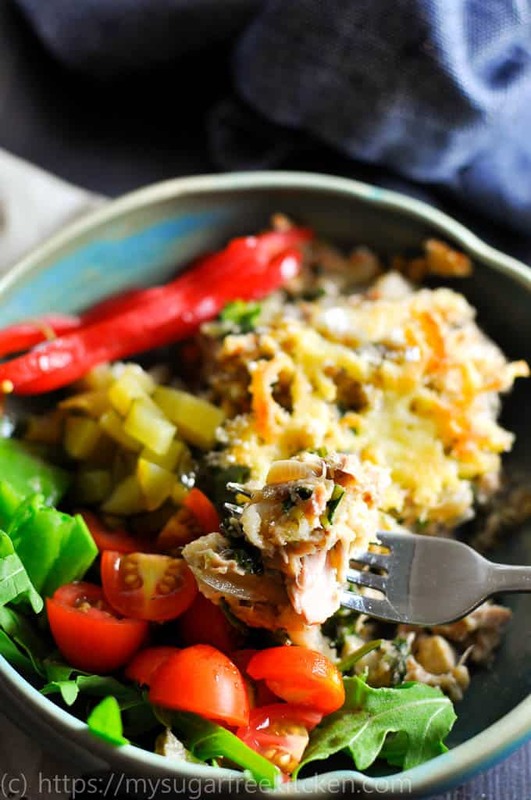 Notes: Tuna bake will keep in the fridge in an air tight container for upto 2 days. Serve with a green salad and a slice of lemon.